The average consumer will not accept the color ranges that were the industry standard ten years ago. They are always searching for a better product – one that gives them the desired properties with a minimum of variation. Because of these requirements, companies are becoming increasingly concerned about color, and color control is becoming. Webster defines color as “a phenomenon of light or visual perception that enables one to differentiate otherwise identi­cal objects”. While the role of light in color development can be discussed in very scientific terms, the idea of “visual percep­tion” can be very vague and very opinionated. For this reason, it is difficult for people to discuss and agree on color. 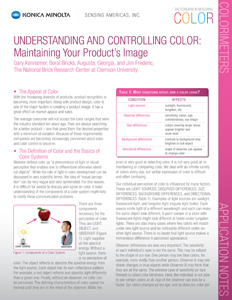 A basic understanding of the components of a color system might help to clarify these communication problems.